Port Safaga, also known as Bur Safaga and Safaga (Arabic: سفاجا‎), is a town in Egypt, on the coast of the Red Sea, located 53 km (33 miles) south of Hurghada. This small port is also a tourist area that consists of several bungalows and rest houses, including the Safaga Hotel, with a capacity of 48 rooms (126 beds). Having numerous phosphate mines, it is regarded as the phosphates export center. A paved road of 164 km (101 miles) connects Safaga to Qena of Upper Egypt. Safaga is a marine port connected by a regular cruise shuttle service line with Jordan and Saudi Arabia. Safaga City is considered one of the most important therapeutic tourist centres, as special medical researches have proved the potential of attracting international tourism to Safaga. The resort is reputable for its unpolluted atmosphere, black sand-dunes and mineral springs which have acquired specific characteristics for remedy of rheumatoid arthritis and psoriasis. Safaga has a small but thriving tourism industry, specialising in scuba diving. Safaga was a merchant port for many years; now the town, with its wide azure bay, long sandy beaches and pretty islands, is a favourite sports destination in the Red Sea Riviera. Safaga is especially popular among kitesurfers and windsurfers, and was the host of the 1993 Red Sea World Windsurfing Championships. At 53 km (33 miles) south of Hurghada, Safaga acquires its unique character from both its port and the small surrounding village. A holiday in Safaga is mainly about watersports and sightseeing, with little nightlife around, except for some nice beach parties organised by the local divers and surfers. The black sand dune beaches characteristic of Safaga are a favourite spot for sun bathers. 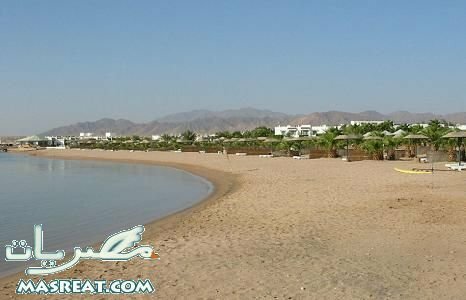 The sea water is known to be highly saline and rich in minerals which are beneficial for the skin, and it is a popular curative destination in the Red Sea Riviera. Safaga is also home to some of the most outstanding diving of the Red Sea, with the bay’s chain reefs of Tobia Arbaa, and the impressive walls of Panorama and Abu Qifan towering reefs, where often big pelagics such as tunas, sharks and mantas can be spotted. Safaga is also a good starting point for a day trip into the Eastern Desert to check out the granite quarries of Mons Claudianus, or to the sights of Luxor, one of the most impressive sights of Egypt, only 220 km (137 miles) away.